Best Value on Sets. Hand Made. A single glass disc 1.25"
Christmas present very well received by its recipient! This quality product gets compliments whenever my wife wears it. Lampworking is a centuries-old glassworks technique, but when Amy Holms does it, the results are thoroughly modern. A residential architect based in Orange County, Calif., Amy can work wonders with a torch. Using traditional lampwork tools, she heats glass to a molten state, then manipulates it into clean, refined shapes. By creating minimalist forms, Amy highlights the pure, exquisite colors of the glass, which she sources from Italy and the U.S. No two earrings or necklaces are exactly alike, since Amy creates each piece by hand. 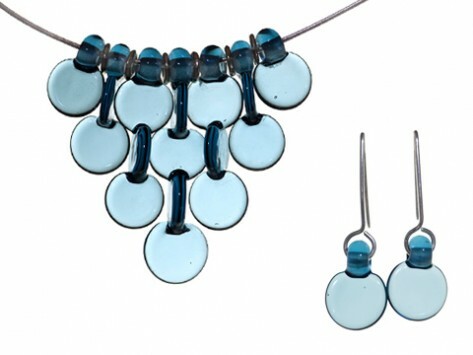 She pairs the glass beads with hand-smithed silver beads, and when she works her signature interlocking glass discs into jewelry compositions, the pieces have a vibrant, dynamic feel. In her work designing houses, Amy gravitates to colorful and modern elements. With her FormFire Glassworks venture, she’s translating that aesthetic into jewelry, using glass as her medium. The distinctively modernist style gives new life to an ancient art.